The Westchester Wildcats celebrated their 30th anniversary in 2015 and we look forward to many more! 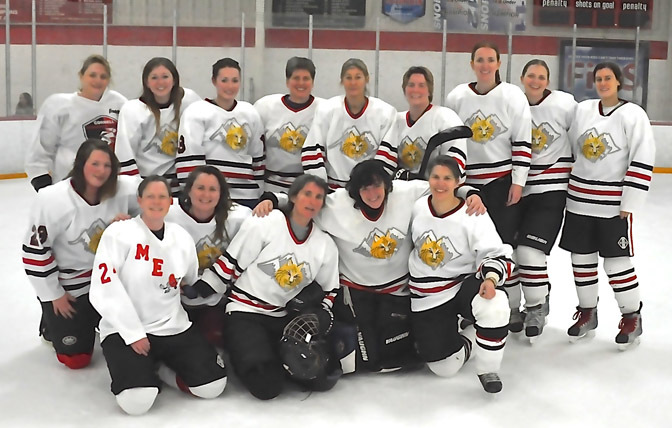 Our women's ice hockey program features two teams of players 18 years and older, and is looking for experienced skaters. Team organizational sessions are held in September. Each team plays about 18-24 games between October and April. Home Games are usually on Sunday evenings at the Westchester Skating Academy in Elmsford NY. Away Games take place in the tri-state area. We have a rec level D team (white) and a C/D team (red). Rosters will be finalized by September 28 and first team practice will be Sunday, September 30 at 8:50 pm. We have ~20 games per season - half away (in the tri-state area) and half at home. Home games will mostly be at WSA on Sundays at 8:50 pm, but possibly some games on Saturday or Sunday at Rye Playland. Practices will be at WSA at 9 pm on Tuesday evenings (twice a month in 2018 and once a month in 2019). Full time players $750. Split season (share with another player and play half of the games) is $620 (but attend all practices if you can). USA Hockey Registration is required to play - sign up at USA Hockey. Contact us at WestchesterWildcatsInfo@gmail.com for more information or to be put on our mailing list. ©2019 Westchester Wildcats Women's Hockey / SportsEngine. All Rights Reserved.